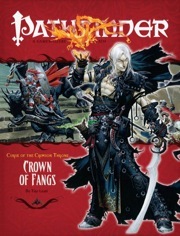 Chapter 12: "Crown of Fangs"
This volume of Pathfinder closes out the Curse of the Crimson Throne Adventure Path, and also features a discussion of Varisia's largest dungeon—the untold vaults below Castle Korvosa, full details on the notorious dragon behind the Curse of the Crimson Throne, and many new monsters to vex and plague high-level heroes. For characters of 14th to 16th level. The final part of the CotCT AP is a little sandboxy and mainly describes the Castle of Korvosa (95 rooms). But we are not in front of a dungeon crawl here, because the PC will have the map of the entire place. "Guys, you have to enter in the castle, find clues of the queen evilness and destroy the devils who may find there. How ? Well guys, everything is up to you. We NPCs will show and act only when it will be no longer dangerous". And this is a little disappointing : the PCs are really on their own during both the castle exploration and the final part in the sunken queen, the main allies only act "off screen" and their actions and the rebellion are too shortly described. It is quite artificial.... but still greatly enjoyable. The last part is great : I really love the fact that the end part of the story is set in a flooded dungeon, with aquatic fights. I also like the use of the blood pool ("oh look, there's a queen in a giant bubble of blood ! ", the references to Thassilon and the "false" awakening of the dragon. The article on Kazavon provides many hooks to enhance and continue the story. Uma verdadeira aula de como fazer tramas épicas e de nível alto, sem apelar para ameaças lendárias ou extra planares que podem destruir o mundo. Simplesmente um final emocionante para a campanha. Infelizmente precisa de um pouco de trabalho para adaptar para as necessidades de cada grupo, mas isso se deve mais a natureza urbana da campanha que permitia que vários caminhos diferentes levassem ao mesmo destino que alguma deficiência do autor. Os artigos suplementares também são de utilidade plena em qualquer campanha e somente o Contract Devil já justifica a compra da edição. Estou impressionado e aguardo cada vez mais. my group had a lot of fun and the ending was awesome. However, as DM I add a lot of my own features and I believe that they did spice up the adventure, especially the entire rebellion story line. This allowed for a lot more RP in my adventure but we all had fun. This adventure has the same chracteristich as all the CotCT AP, GREAT encounters. You finally retur to the home city and have your chance to set things right in may places, yet you don't really get to "recover" your beloved city but pave the way for the NPCs to do so. You deal with the main villains but if the DM doesn't put a great effort to make it look so, the PCs can go from one encounter to the other and finish the adventure and just realize that everything is "ok" now. If the DM puts some effort to roleplay scenes where the city is taken back this "issue" can be easyly overloked. Other than this, personally I would have loved to have the final encounter beign done in the city, since Korvosa was the anchor for most of the adventure, it was rightly so to have it finish it there. There's a perfect reason for this final encounter to be made elsewhere, but with a tiny bit of effort the DM can wave this encounter into the Ziggurat below castle Korvosa and make very little changes. The encounters, npcs, scenes and detaits on the adventure are -5 stars-, yet the missing links to make this a more "Korvosan" closure adventure take a couple stars... Yet if you are not using CotCT as a AP or you don't care much for Korvosa Roleplaying, then this is a 5 star adventure! this adventure just missed so much. I expected it to be epic, to have grand fighting scenes set in an even grander background. I wanted resulotion and I wanted to know the fate of some major NPC's, but all Iv'e got was a list describing the fate of the NPC's niether me nor my players care about. all that being said, the adventure's not bad, merley disappointing. mybe if they wouldn't have used half the space they had for describing *evrey single room* in the castle, the outcome would have been better. Do we know when this will be shipping yet? 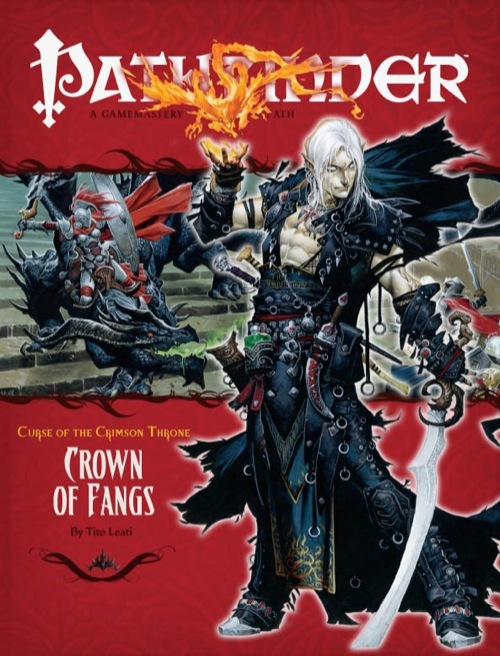 My order shows "pending" - come on, come on, flip the switch on the PDFs already so I can get me some Crown of Fangs goodness. Are you really shipping #12 and #13 at the same time? My order shows both Pending. Not that I would complain but just curious if this is right. Yes! We're finally caught up, and plan to stay that way! Mine is "pending" as well. Looking forward to reading it (and getting notice of the PDF...). Happy Birthday to me then hopefully I'll get mine soon. July 31, 1972 is day I came into this world.